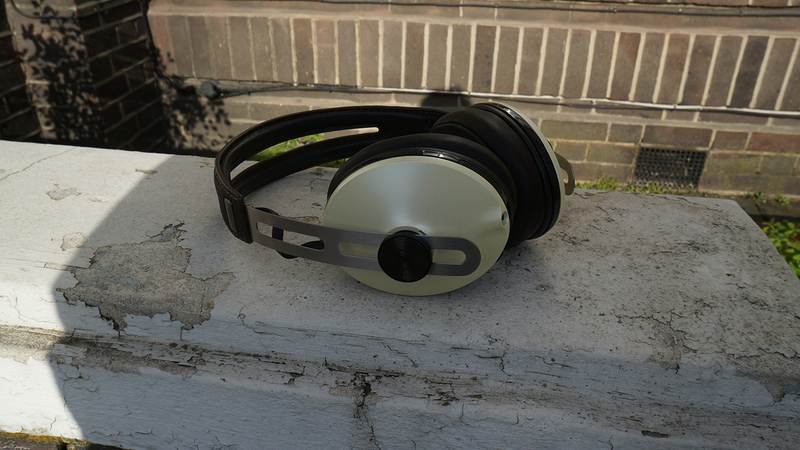 Has Sennheiser surpassed itself with these updated wireless Bluetooth headphones? If you’re looking for an awesome pair of headphones, then you’ve come to the right place. Sennheiser’s Momentum Wireless are easily some of the finest cans we’ve ever had the pleasure of listening to, and we spend the majority of the day with a pair clamped over our ears. They might cost the fatter part of £400, but if you’ve got the cash then there simply isn’t a better product out there. While Beats by Dre may grab all the headlines when it comes to pricey over-ear headphones, the overly-bassy noise and less than fantastic sound they provide is definitely not to everyone’s taste. Step in Sennheiser, who has been building a fantastic slew of premium cans recently in the shape of the Sennheiser Momentum range. Sennheiser’s latest entry in that line up, the Sennheiser Momentum Wireless over-ear headphones, are a sizeable change for the series, gone are the wires with Bluetooth taking over. But are they still among the best over ear cans you can buy? Or does an essentially identical design to last year make them an update worth giving a miss? Let’s start with the area that sets great headphones apart from the mediocre ones, sound quality. Featuring a closed back design, just like the original wired model, these cans have a perfectly balanced sound that impresses whatever genre you throw at it. Whether you’re pumping out gritty rap or detailed jazz, the Sennheiser Momentum Wireless Over-ears shine. The mid and high tones are pitched perfectly, interference never happened and the bass levels, while not on Beats by Dre levels, are just about the right amount for our ears. Considering these headphones are Bluetooth, the fantastic sound is even more impressive. If you like to listen to your tunes without the distraction of others, you’ll appreciate the addition of active noise cancellation here. The isolation is effective (it’s powered by what Sennheiser calls NoiseGuard tech) and unlike some other headphones we’ve tried, there’s no loss of overall sound quality when the cancellation is implemented. The ear cups also pack mics, so you can use these cans as a voice conferencing tool. As you’d expect, calls come through crispy and clear. If you put the Momentum Wireless and the older wired version next to each other, you probably would find it difficult to tell them apart. Apart from the lack of a cord, of course. It’s a bit like comparing the HTC One M8 to the M9, there are differences, but they are small. 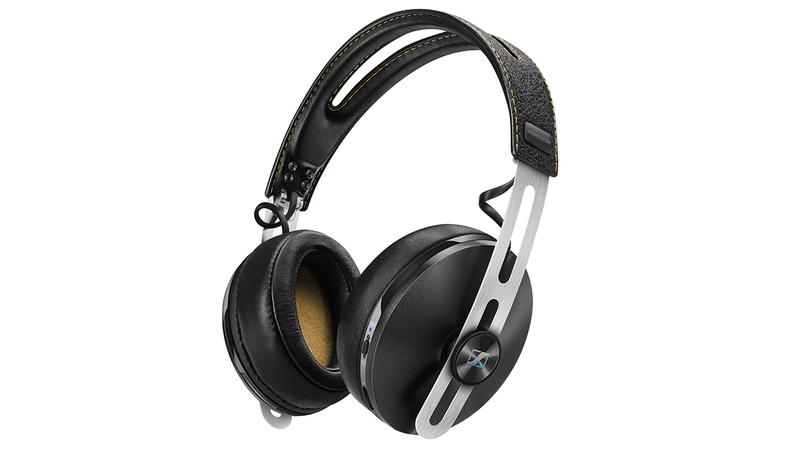 Saying that, we have no complaints about Sennheiser sicking to an industrial design it knows well. The coupling of metal and leather combines to give a look we love, while the stainless-steel headband is strong. Aside from on the cups, there is almost no plastic used on these cans. Speaking of the ear cups, these have seen a slight size increase over the last model so they fit a little bit better over the whole of your ear. We never had any complaints before about the ear cup size, but comparing the two you can definitely feel a difference. 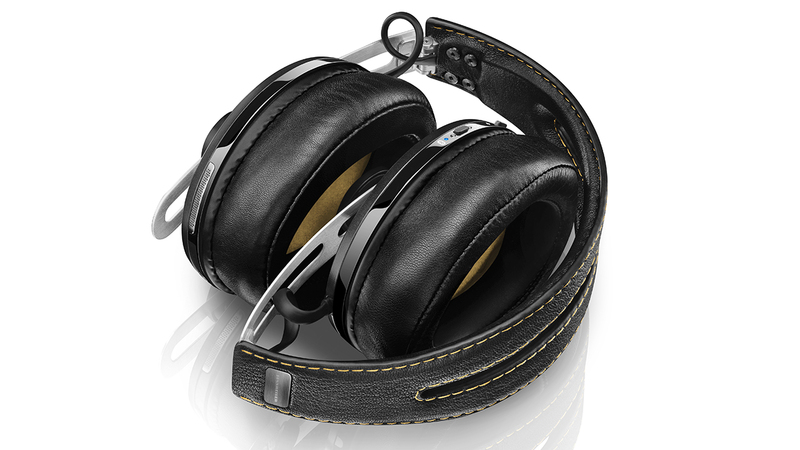 It makes these some of comfiest headphone we’ve worn for long periods of time. The biggest change though is with the headband, which is now no-longer completely rigid. YAY! One of the main problems with the original Sennheiser Momentum line was the stiff headband, which made them a pain to use when travelling, but the updated model features a foldable version that brings the package size down quite a bit. Not everything is entirely top drawer though. The new Bluetooth controls have been moved to the ear-cup, previously living on the cord, but the buttons themselves are now disappointingly plasticky and mushy. No big deal, but worth a mention nonetheless. We used these headphones everyday for a week and only had to charge them once. We have to say that’s rather impressive. Sennheiser states battery life is 23-hour and for the most part that seems accurate, if slightly below what we achieved. And with the included cable you can keep the music flowing even when the battery is dead. Another great addition. The included 1.4m cable is sturdy and feels premium and we’re big fans of the right angled jack, which adds an extra chunk of durability. While we’ve only had these cans in our hands for a few weeks, we feel confident in saying that they’ll last you a long time, something you’d expect when you’ve shelled out nearly £400. The combination of aluminium and leather lends a premium feeling and we haven’t any scuffs and marks appear so far. These are very expensive headphones, never doubt that. But all that money gets you bucketloads of quality in return. The build is durable, the materials used are classy and the addition of a foldable frame, something missing on the original, shows that Sennheiser is really thinking about it designs these headphones. Sound is key though and the rich noise pumped into your ears, combined with just enough bass, is a joy to behold. NFC, active noise cancellation and the mobile-compatible microphones all add to the package, but fantastic sound is the true success here.